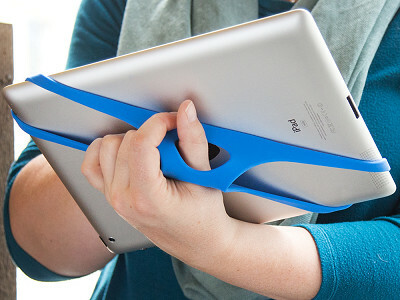 Padlette is a tablet hand strap that makes holding a tablet with one hand easy. Stretch the silicone over two opposing corners, and one-handed interaction becomes natural. Even gesturing or walking along, Padlette stays put. Tablets make technology more mobile, so they’re prone to being dropped. We cover them with cases hoping to minimize the damage. But Padlette takes a different approach, giving you more mobility while minimizing the risk of dropping. Founder Hank Baker was camping when he realized how hard it is to hold a tablet while sitting or moving. Inspired by the way painters hold a palette, Hank came up with the design and the name. Designed to fit most major tablets, Padlette even fits over a case. You can choose which top corner to hook it on to, with a simple design that makes it a snap to attach and remove. Hello, I’m Hank, one of the founders of Padlette. As tablets become standard mobile devices at home, in the office and all points in between, we felt compelled to offer accessories that make tablet use easier, safer and more enjoyable. We're thrilled to be launching our D4 and D3m designs today with The Grommet and I look forward to your comments. Hank, please define the sizes which this unit is capable of holding. Thanks. @Alan Click on the plus sign (+) in the lower left corner of picture. Dimensions shown in description. Yes, this can be confusing. Tablet sizes are often described by the screen dimension as measured diagonally. So a full size iPad would 9.7 (even though edge to edge it is 9.4). So our D4 is designed for all full-size tablets while the D3m is designed for all mini, or "junior" size tablets. Given that each tablet maker now makes several sizes you can use as a rule of thumb D4 = big tablets and D3m = small tablets. Does that help? Will this fit a Kindle? @Betsy Please see reply to Alan. Hi Betsy, as I just replied to Alan on the same subject, Amazon now makes many different sizes of its Kindles. some are in the full-size tablet class and others are in the junior (i.e. 7" tablet/eReader) class. So we we make Padlettes for both of these size classes. Grommet is offering our D4 for the full-size and D3m for the smaller tablets. Now if one has a smaller tablet but a big, fat case, one might want to go with the larger D4 but both should work fine. I hope this helps. Looks a bit uncomfortable, but willing to try it. 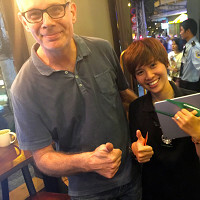 Will the larger one fit the Samsung Galaxy 12.2 tablet? Hi Suzanne, don't worry, you will find those hand and finger positions that are comfortable to your situation. The product is versatile enough to give you lots of choices you just have to experiment a bit. Regarding the 12.2 Galaxy is that is a big tablet. Honestly, you would have to try our D4 and see how you like it. At first you might want to give the Padlette a few good tugs to limber it up first. I have an ipad mini 3. should I purchase the mini tablet holder? Hi Jeanne, yes, you want the "D3m" model. "M" stands for "mini". Help! I have a Kindle HD 8.9 which seems to be in between the large and small sizes. I love the idea but am unsure which size is better. Hi Nola, your are correct, your tablet falls in between a full-size and a junior but that is good news. You can choose either the D4 or the D3m models and both will be fine. The D4 and D3m Padlettes don't just differ in size, however. They also differ in shape so that they offer slightly different hand/finger positions. Also, if you want to use the Padlette with a case or a shell, that would tip me towards choosing the D4. I hope this helps. Hi Christopher. It is kind of a long story. In my life prior to Padlette I was living and working in Vietnam for many years so that's where we started. When we actually launched I was living in New Zealand and so I got familiar with manufacturing costs there as well. Put to your point, this summer we will be looking at production facilities in the US as well. Thanks for your support. @Hank thanks hank, going to order for my brother, who is in the outdoors for work a lot, and has remarked about walking with his devise, and the fear of dropping it due to treacherous terrain. great "simple" solution! Thanks Christopher, we all need a bother like you. Some of our customers report that they use a Padlette even with a big, chunky protective case. At any rate, your brother can let go of worrying and enjoy being outside.